The Tempest is one of my favourite Shakespeare plays, and I’ve seen it more times than I can count from high school productions right up to the RSC. I have to admit, going into LUTG’s show, I was expecting to be disappointed. Thankfully, director Connor Gould did a stand-out job at staging the show in a new and exciting way. This production demonstrated an exceptional grasp of the source material, abridging the play himself to highlight the comedic aspects of this tragic-comedy, and an entertainment factor usually lost in Shakespeare. Often in abridged productions, elements like the Masque with Ferdinand (Isaac Rolfe) and Miranda (Georgia Moore) get cut, or the subplot with Trinculo, Stephano and Caliban is reduced (Eddie Sophie Edmunds, Malka Kovalenkom, and Andrew Holt). Luckily, this production made use of these typically underplayed aspects to offer a more entertaining presentation of the characters. They made great use of songs in both cases, and I admired the contrast between Trinculo and Stephano’s clown-like appearance and drunken acting with Caliban’s monstrous form and disgusting behaviours (such as eating spaghetti out of his moss covered pocket- a rather unpleasantly amusing touch). The set and costume design for this production was beautiful. The use of old cereal boxes to make Miranda’s outfit and the underground, industrial appearance of the set was immensely professional. Megan Bowyer and Emma Turner should be proud of themselves. Audience interaction was a vital part of this production, with the interval potentially being the most entertaining aspect of the whole show. From Prospero (Calum Rowan) reading The Tempest for Children centre stage as his magical book replacement to Alonso (Tosca Herson) hiding from the over-enthusiastic Gonzalo (Jayran Lear). I’m pretty sure I agreed to a murder plot with Antonio (Rose Briggs) against Sebastian (Tom Wilson), but thankfully I wasn’t called up on that. It made the whole experience much more fun and engaging than regular theatre. Jay Godden’s Ariel was a highlight, mixing a spirits physicality with the character’s playful nature. However, I would say that they could have made more of the famous Harpy scene. The effect of the wings was breathtaking, but in being so distracted by this effect the words that terrify Antonio and his party to the depths of their souls were somewhat lost. Perhaps in emphasising the comedic aspects, some of the more serious, tragic elements were lost, and yet in saying this, I would rather have this outstanding presentation of the comedy than a production that tried to dance between the two. Saying this, I did find that the actors at times were enjoying themselves so much in their roles that they forgot to slow down. Among the great comic moments, I felt that they lost some moments in hastily spoken dialogue that they could have made more of. This could have been out of first-night nerves, but its something for the actors to consider in their future roles; that they can afford to take their time and make a good performance into an exceptional one. 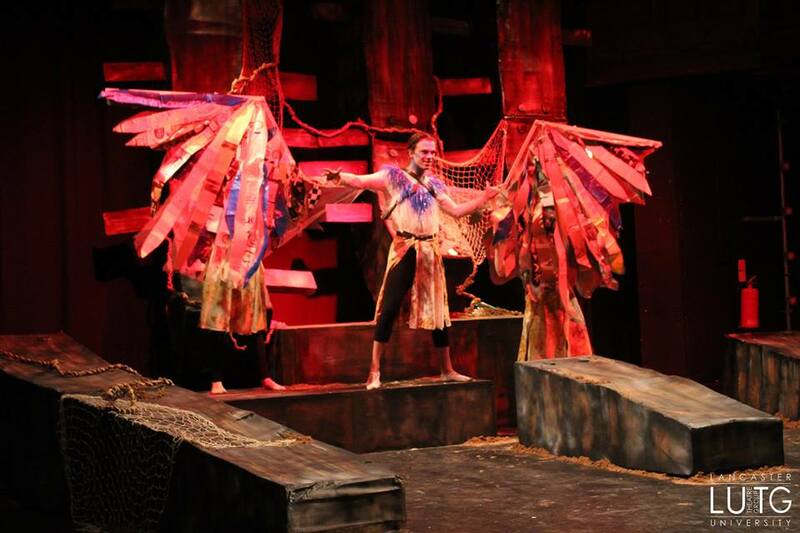 Overall, I would happily watch this production of The Tempest again, and it was an excellent way to end the term. Despite my criticisms, they are minor nitpicks that by no means detracted from the overall performance. This cast and crew should be immensely proud of what they achieved.